More than three decades have passed since David Sear published Greek Coins & Their Values, his revision of Gilbert Askew’s A Catalogue of Greek Coins published by B. A. Seaby in 1951. Since then, the field of ancient numismatics and the hobby of collecting ancient coins have changed so much that now Greek Coins & Their Values would require a complete revision to include all of the most current numismatic information available, list the many new types and varieties unknown to Sear, and determine an approximate sense of rarity for all of these issues. In order to encompass this new material and create a viable reference for the beginning and specialized collector, such a handbook would have to be more than the two volumes which Sear found necessary. As a result, Classical Numismatic Group is publishing The Handbook of Greek Coinage Series, written by Oliver D. Hoover, in a series of 13 volumes, each covering a specified area of Greek coinage with the first being The Handbook of Syrian Coins: Royal and Civic Issues, Fourth to First Centuries BC (Volume 9 in the series). This series is designed to aid the user in the quick, accurate, and relatively painless identification of Greek coins, while providing a cross-reference for each entry to a major work, which will allow the inquirer to pursue more in-depth research on the subject. The subject-matter of each volume is arranged chronologically for royal issues, and regionally for the civic issues; within each region, cities are listed directionally, depending on the region. For those rulers or cities that issued coins concurrently in all three metals, these issues will be arranged in the catalog with gold first, followed by silver, and then bronze; each metal is arranged by denomination, largest to smallest. Known mints for the royal coinage are listed below the appropriate type, making an easy search for a specific mint. Each entry will include a rarity rating based on the frequency with which they appear in publications, public and private collections, the market, and/or are estimated to exist in public or private hands. No valuations are listed, since such values are generally out of date by the time of publication. An online valuation guide at www.greekcoinvalues.com will allow interested individuals the opportunity to gauge the market, and reduce the need for repeated updates of this series. Whether one purchases the entire set for their reference library, or the individual volume pertaining to one’s area of specialization, The Handbook of Greek Coinage Series should provide a useful staging-point from which collectors and interested scholars can pursue their research and interests. 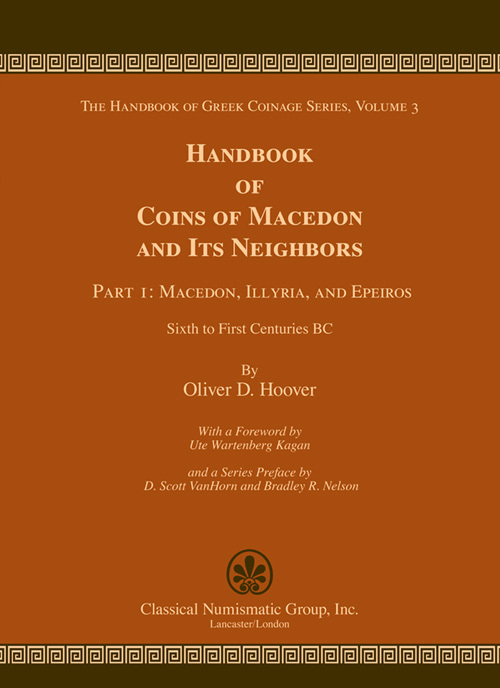 The ninth published volume in the series is Handbook of Coins of Macedon and Its Neighbors. Part I: Macedon, Illyria, and Epeiros, Sixth to First Centuries BC (Volume 3 in the series). This volume is arranged geographically from the Adriatic Sea, beginning with Illyria, through Paionia and Epeiros, eastward to eastern Macedon. Civic and tribal issues of each area are followed by dynastic and royal coinage, Civic coinage is arranged chronologically, beginning with the Archaic issues and continuing through the later civic issues. Where rulers or cities issued coins concurrently in all three metals, these issues will be arranged in the catalog with gold first, followed by silver, and then bronze; each metal is arranged by denomination, largest to smallest. Postage and handling rates shown on web generated orders do no apply. We will confirm postage and handling upon receipt of order and confirmation of shipping method. Published by Classical Numismatic Group. Dealer inquiries invited.